Despite efforts in preventative care, the incidence and mortality rate of melanoma have continued to rise. However, in the past decade, an increasing understanding of melanoma immunology has resulted in tremendous bench to bedside advancements in melanoma therapies. Many of these new treatment modalities have proven efficacious, leading to seven new melanoma therapies receiving FDA approval within the past 5 years. This chapter explores our current understanding of melanoma immunology, with an emphasis on tumor microenvironment and the ability of melanoma to evade immune surveillance. 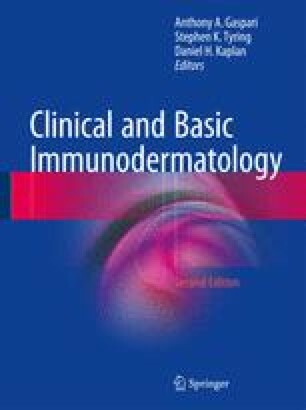 The remainder of the chapter focuses on how this understanding of melanoma immunology has been translated into clinical therapies. These agents include cytokines such as interleukin-2 and interferons, checkpoint inhibitors such as anti-CTLA4 and anti-PD1 antibodies, and vaccines. For each melanoma therapy, mechanism of action, efficacy, side effects, dosing strategy and future directions will be discussed. Interleukin-2 therapy is limited by what type of side effects? What is the mechanism of action of ipilimumab? What is the mechanism of action of nivolumab? Can combination immunotherapy be utilized in the treatment of metastatic melanoma? Describe how adoptive cell therapy (ACT) works in immunotherapy of melanoma? American Cancer Society. Key statistics for melanoma skin cancer. 2016; http://www.cancer.org/cancer/skincancer-melanoma/detailedguide/melanoma-skin-cancer-key-statistics. Accessed July 20, 2016. Melanoma treatment. 2015. Accessed 5 April 2015, at http://www.cancer.gov/cancertopics/pdq/treatment/melanoma/HealthProfessional/page8. FDA approves Opdivo for advanced melanoma. 2015. Accessed 5 April 2015, at http://www.fda.gov/NewsEvents/Newsroom/PressAnnouncements/ucm427716.htm. FDA approves Keytruda for advanced melanoma. 2015. Accessed 5 April 2015, at http://www.fda.gov/NewsEvents/Newsroom/PressAnnouncements/ucm412802.htm.